Flowers always bring out a smile! I received a Teleflora’s Send A Hug Bear Buddy Bouquet to facilitate this post. There is something special about flowers. They always seem to bring a smile to my face when I see them. Flowers are just so pretty and they also smell nice. Flowers can always put me in a good mood. especially when I get a hand-delivered bouquet that is hand-crafted by a local florist. Flowers can brighten up a room also. I love using flowers in my decorating. Flowers always add that special touch to my holiday table. Since flowers make me happy, I know that a beautiful flower bouquet makes the perfect gift for many people on my gift list. My mother is one person who loves receiving flowers and I always send her some for her birthday. 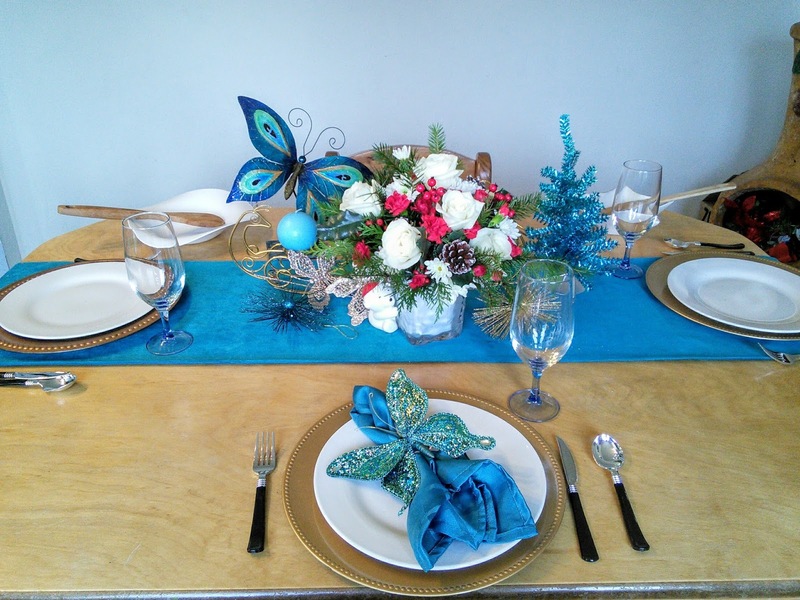 This year I think I will surprise my mom with flowers for Christmas. I know she will like the Teleflora’s Send A Hug Bear Buddy Bouquet or many of the other holiday bouquets that Teleflora has this holiday season. 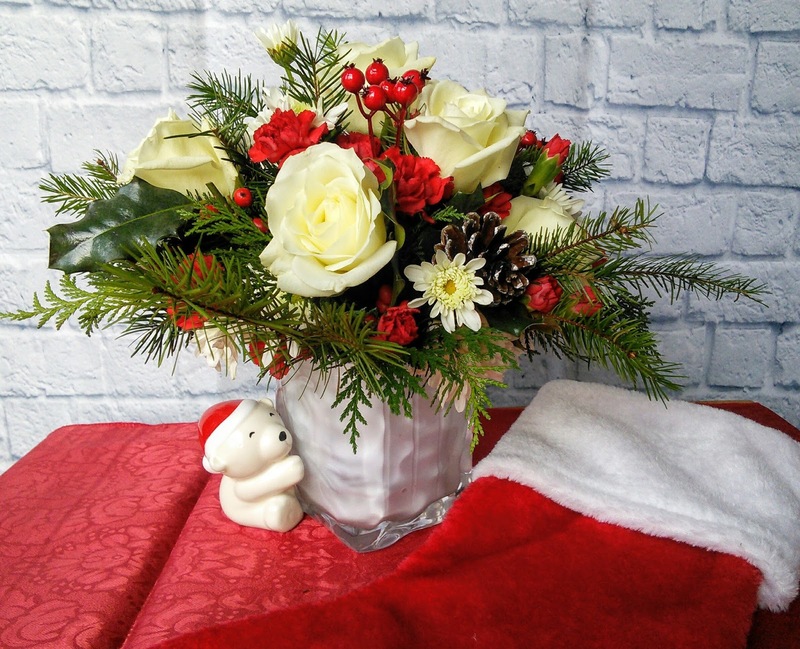 This adorable flower arrangement has a lush array of red and white blooms with plenty of holiday greens that are accented with red berries and snow-tipped pinecones. 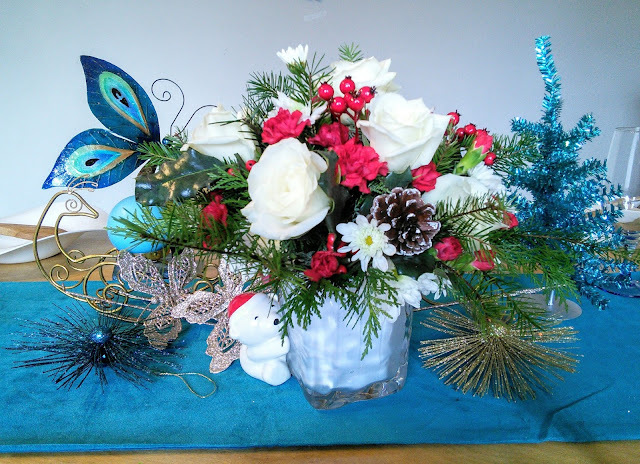 The festive flowers are featured in a hand-blown, frosted glass cube that has a cute cuddly polar bear on it. This wonderful vase can be cherished for many holidays long after the flowers are gone. I can see my mom using the vase for Christmas candy. Who will you surprise with flowers this holiday season? I am sure there is a special friend or family member who would be overjoyed with receiving a beautiful bouquet of hand-crafted flowers that arrive in a keepsake vase. Teleflora has many holiday flower bouquets that will brighten someone's day. Flowers are a perfect gift! The flowers that I received look so pretty on my table and they smell so good! and delivered by hand by your local florist. By tapping over 10,000 member florists in North America alone, Teleflora offers the kind of personal touches, artistry, and expertise you expect from a trusted neighborhood florist—even if that neighborhood is across the country. No prepackaged flowers in nondescript boxes dropped on your doorstep—Teleflora’s network of professional florists create artistic arrangements personally delivered in a vase, often on the same day. Teleflora makes every day an occasion with a 2-in-1 gift that includes a multi-purpose keepsake container for long-lasting enjoyment. Follow Teleflora on Facebook and tag your own #LoveOutLoud moment. Flowers do make me happy! I love flowers and especially receiving them. This is great gift idea for holidays! I wish fresh cut flowers lasted longer than a week as they are so pretty. You can always give some one a plant with flowers as they last way longer. Flowers are a great answer for most things. Those are gorgeous and would look great for Christmas. These are so pretty. I get flowers for my mom and some of my female friends. It IS a great gift! My mother loves getting flowers. They are guaranteed to make her cry. What a great gift! I remember giving some poinsettias to my roommates parents when I was in college and they were thrilled. I think plants and flowers are good gifts for parents!! These arrangements are beautiful. I agree that flowers are always the perfect gift, you can never go wrong with the gesture. Prices are reasonable, food is delicious, and wait staff is sweet, conscientious, and adorable. I came here for an event, got contained to upstairs. Service at event halls for rent was prompt and food was awesome. Blossoms are an awesome response for generally things. I wish new cut blossoms endured longer than seven days as they are so beautiful. You can simply give somebody a plant with blossoms as they last way more. I need gifts for lonely elderly parents.